Another great opportunity to take in Canadian culture right here in Rome. Two of Canada's most celebrated and original jazz artists are making their debut together at the Rome Auditorium on May 3rd, as part of the Auditorium's "Jazz Love" series. Collectively, singer/pianist Elizabeth Shepherd and guitarist Michael Occhipinti have earned 12 JUNO Award nominations, and they have begun work on their first joint album celebrating the vibrant music that came out of Toronto’s Yonge Street in the 1960s. Both have been praised by critics for their imaginative original music and interpretations of popular songs, and for their Rome show they’ll be exploring the Canadian Songbook. But the CCR also has the very special opportunity to welcome a limited number of people to meet Elizabeth and Michael at a pre-show, backstage artist talk! This is your chance to learn more about these performers' creative process and ask questions about both their music and careers. If you're a musician yourself, they'll be happy to give tips and share stories. 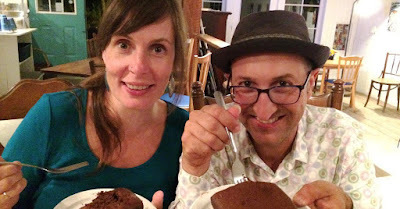 Elizabeth and Michael love chocolate cake almost as much as they love jazz! To see some videos of their work, please visit this page. Time: Concert starts at 9 p.m.; pre-show artist talk (only those on CCR list) from 8 to 8:45 p.m. (details sent to confirmed participants). Where: Teatro Studio Borgna inside the Auditorium Parco della Musica complex, Viale Pietro de Coubertin 30; pre-show artist talk in a backstage room. Cost: €15; purchase your own tickets before the concert. See this page. RSVP for the pre-show artist talk: to canadarome@gmail.com ATTN Anna. Spaces are limited so reserve early. Open to both CCR members and friends but for security reasons your names must be on the CCR list in order to be admitted to the artist talk. NB: Remember that you are responsible for purchasing your own tickets to the performance.